The complex is centrally located and comprises of five modernly designed buildings, approximately 70 meters away from the golden sandy beach. All apartment buildings share one reception and have separate lobby and lift. Golden Sands is Bulgaria's leading up market holiday resort offering relaxation and recreation for all ages. It has a lively nightlife including bars, restaurants, shows and casinos and a beautiful stretch of sandy beach with clear blue (despite the name) sea. 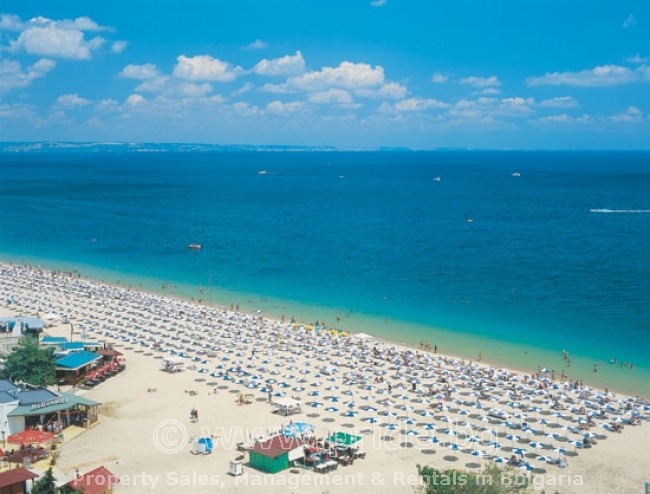 It is an award winning Blue Flag beach close to the city of Varna. This newly built apartment is located on the third tier of the resort away from the throb of the night clubs yet only a 3 minute walk should you wish to go out. There is a well maintained communal area and plenty of places for walks. The apartment is on the third floor with a beautiful quiet terrace area and easy access to the golden sands. Having a nice double bed in the bedroom and a sofa-bed in the living room this apartment can accommodate 4 people. The kitchen has everything what you would need for a nice holiday - oven, fridge, kettle, hob, ... Each room has own Air-Conditioner. The resort of Zlatni Pyasatsi (Golden Sands) is the largest one on the northern Black Sea coast as it is built on more than 1,800 hectares of land. It is situated 18km north of Varna and is bordered on the north by Kranevo and on the south by the St. St. Konstantin and Elena Resort. The beach of the resort stretches over some 4km with width of up to 100 m. Almost the entire coast along the resort falls within the boundaries of the Zlatni Pyasatsi natural park, which stretches over 1,320 ha. The Frengenskoto Plato (Frengen Plateau) of limestone structure, liable to landslide and erosion, is perking just above the resort. The area is famous for the purest sand on the Black Sea coast and also abounds of trees and bushes. Mineral water springs, as well as the marvelous wood bordering the Frangen Plateau turn Golden Sands into one of the pearls of the Bulgarian coast. A constant temperature of about 27°C throughout the summer season makes it a wonderful place for a summer holiday. In Turkish times the area was called Quzounkoum, meaning literally "long sands". It was not inhabited up to the 50ies of last century. The resort’s construction started in 1957 and in about two decades, the area was transformed into a modern holiday complex with more than 100 hotels, numerous restaurants, bungalows, camping sites, etc. The impressive Aladzha rock monastery is one of the best preserved rock monasteries, scattered all over the Dobrudzha region. It is situated only a few kilometers above the resort and is also a part of the Zlatni Pyasatsi natural park. Relatively close to Golden Sands (about 30 km.) is also the town of Balchik with its beautiful palace and botanic garden. The resort has a casino, a number of bars, a mini-golf playground, horse-carriages and attractive carts, water slides, good conditions and equipment for all kinds of water sports, under the supervision and with the help of licensed instructors. During the peak season, one can attend or participate in the Strongest Man Competition, the Miss and Mister "Zlatni Pyasatsi" Competition, competitions for all breeds of dogs, the Satellite Tennis Tournament, the Old-fashioned Auto Rally, an international dance festival, etc. Besides the fact that each hotel has a snackbar or a restaurant, there is a number of restaurants offering various kinds of specialties and entertainment in different styles with the country’s top artists with guest performances in Golden Sands. Vodenitsata, Tsiganski Tabor, Kosharite, Zlatna Ribka, Kriva Lipa and Dionisius are of particular appeal for their design, cuisine and entertainment programmes. There are also a lot of snackbars, fast food, grill- and toast-bars. Transport between Golden Sands and Varna is remarkably well organised. Apart from regular bus lines connecting the resort to the city and also to its airport, there are a lot of minibuses, private route taxis and ordinary taxis. Because of intense competition, fares are moderate.